This is not an extension for the faint of heart. If read receipts on iMessages freak you out, then read no further — this is not the tool for you. If, however, you want to know that you are being ignored, rejected, or otherwise put off, then go ahead, install Mailtrack. It’s a simple, easy-to-use read receipt for emails that can be equal parts incredibly useful and disheartening. 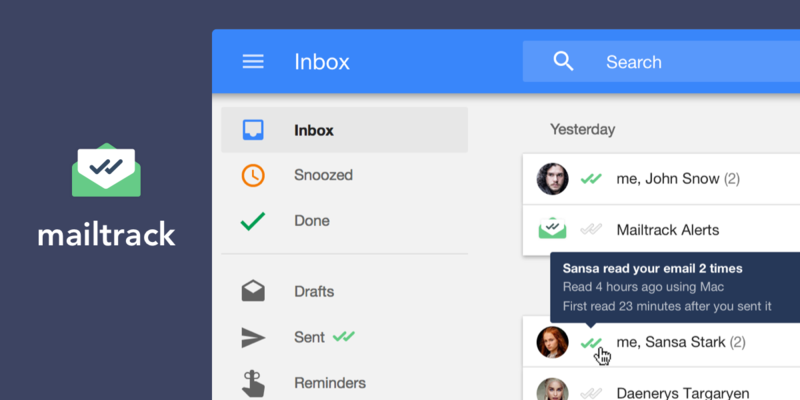 Today, the Barcelona-based startup released its newest version for Inbox by Gmail. One of the largest releases from the Mailtrack.io team to date, this latest update lets you see whether or not your email has been opened, how soon after it was received it was open, and how many times sit was opened. If that sounds like information overload, we understand — sometimes, ignorance really is bliss. But hey, if you’re of the opinion that knowledge is power, then you’ll be joining the more than 1.5 million folks who have signed up for Mailtrack in a little more than three years. Indeed, during the startup’s short lifetime, it’s seen 300 million emails sent with its tracking feature. Today, the free Mailtrack extension is available for Google Chrome, Firefox, and Opera. It emulates the popular check mark-based interface used by Skype, Facebook Messenger, and WhatsApp to notate whether or not your email has been read, and while it has plenty of competitors, it looks like it’s leading the field. Indeed, the Mailtrack team told Digital Trends, it has recently surpassed by Streak and Yesware in its number of Chrome users.